Night-Thoughts on Life, Death and Immortality. London: Printed for A. Millar and R. and J. Dodsley, 1756.
secured with copper staples. Collection of the artist. 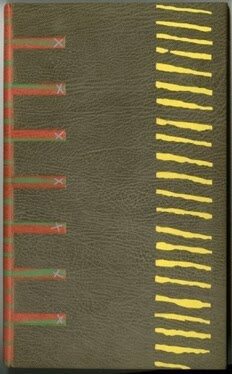 "It's very difficult to work as a bookbinder. The minute I started to make jewelry – everybody wants to buy jewelry. The first show I had, I sold everything, and I had commissions for 18 months." Those words are like the painful whine of the dentist's drill to lovers of fine bindings and artists' books. 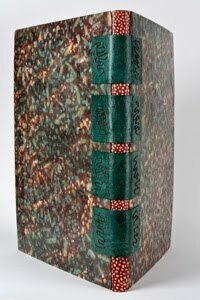 And, sadly, they come from one of today's premier practitioners of the art of bookbinding, Romilly Saumarez Smith. 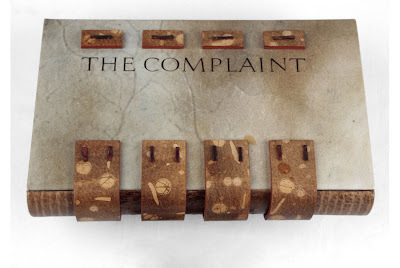 A new exhibit at the Yale Center for British Art spotlights the twenty-five year career of Saumarez Smith as a book artist, and her gradual progression away from that art form to her new status as a creator of one-of-a-kind fine jewelry. The show, Structured Elegance: Bookbindings and Jewelry by Romilly Saumarez Smith is the first to show her distinctive work in both mediums and to explore the relationship between them. It features nearly fifty objects loaned by the artist and by private collectors in the United Kingdom and United States. Collectively, these works of art display a kind of alchemy, a gathering of the finest materials transformed by an artist's talent and passion into something much more than the sum of their parts. Not exactly turning dross into gold, but perhaps turning cool, clear water into vintage champagne. CAVAFY, Constantine P. A Selection of Poems. London: The Camberwell Press, 1985. Goatskin with onlays of dyed goatskin and glacé leather. Romilly Saumarez Smith studied binding and paper conservation at Camberwell College of Arts in London and went on to become the first female union member and forwarder at London’s famed Zaehnsdorf Bindery (now a part of Shepards, Sangorsky and Sutcliffe). She was elected a Fellow of Designer Bookbinders in 1984 and taught at the London College of Printing and the Guildford College of Art and Technology. Her public commissions include bindings for the Victoria and Albert Museum and for the annual exhibitions of the Booker Prize winners for contemporary fiction. 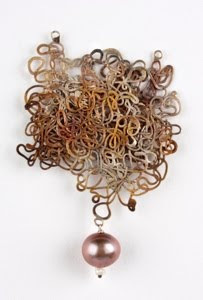 Saumarez Smith is represented in the collections of the Contemporary Art Society, the Crafts Council, the British Library, the Harry Ransom Center, and the New York Public Library, and she has exhibited in Britain, the United States, France, and Germany. PERRAULT, Charles. Histoires ou Contes Du Temps Passé. in box covered in paste paper and cloth. Collection of Lily Le Brun. Structured Elegance has been co-curated by Elisabeth Fairman, Senior Curator of Rare Books and Manuscripts at the Yale Center for British Art, and by artist and Professor in Research at Wimbledon College of Art, Eileen Hogan. Hogan herself was a practitioner of lettering and book arts, first at the Royal College's Lion and Unicorn Press and then with her own imprint, Burnt Wood Press. In 1984, she founded the Camberwell Press, only the third collegiate press to be established in a British art school. Here, between 1984 and 1996, she published a wide range of new and existing texts, designed and illustrated by herself and many other artists. And here she became enamored with the work of Romilly Saumarez Smith. SHAKESPEARE, William. Antony & Cleopatra. Guildford, England: Circle Press, 1979.
bound by Romilly Saumarez Smith. green lizard skin straps with copper fastenings. Collection of Linda L. Brownrigg. Smith was uninterested in creating traditional "fine bindings." What she found fascinating was the physical structure of the book--particularly areas often neglected by book artists, such as the connections between the spine and the cover. She also chose to use unconventional materials and techniques. For example, drenching cotton mattress ticking in leather dyes and finishing it with hand-rubbed beeswax to create an intricate chiaroscuro effect. Though her work was bold and innovative, she never lost sight of the fact that the binding must underline and enhance the text of the book. As her craftsmanship evolved, Smith found herself using more and more metal to both reinforce and decorate her bindings--especially large staples, inlaid copper wire, and adornments made from precious alloys. This penchant for metallurgy lead to her initial creation of a piece of jewelry. Oxidized silver and eighteen carat gold. Saumarez Smith likens becoming adept at an artistic discipline to falling in love. But for that passion to flourish, the right ingredients are essential. She found this becoming impossible in the realm of bookbinding. "It became more and more difficult to get good vellum," said Saumarez Smith. "That's what drove me away from bookbinding: I couldn't get decent materials." While comparing the process of leaving bookbinding behind to undergoing "a terrible divorce," she began to concentrate on jewelry design. She says: "With any craft, you need a terribly clear idea what you’re doing and, after all the books, I think I finally have that. When something is right for me, I get a certain rush of excitement. … I think the same thing happens to every creative person and that, when it does, it can be very powerful…. When you realize that, you feel 'I am in a tradition.' To me, that’s a consolation, it’s a tremendous comfort." For collectors and admirers of fine bindings this change in medium from books to jewelry is distressing rather than comforting. Though Romilly Saumarez Smith's nests of twisted wires enhanced by exquisite precious gems are undeniably beautiful, book lovers can only hope she once again hears the music of Calliope, the muse of poetry, or gets a message from St. Francis de Sales, patron saint of writers, and returns to creating masterpieces of book art. Structured Elegance will continue at the Yale Center for British Arts through September 19, 2010. Family Feuds, Curses, and Treasures. 2009 Designer Bookbinders Competition Winner Announced. It is too bad she gave up making bindings since that was far more specialized. But I can see why she did.